NETWORK FINALS: 20/20 gained 0.1 in final numbers, and the rerun MASTERS OF ILLUSION lost the same. CABLE HIGHLIGHTS: A&E’s LIVE PD returned after several weeks of reruns to lead Friday cable at 0.64, with the preceding clip show up 0.09 to 0.39. ESPN’s COLLEGE FOOTBALL doubleheader was at 0.51/0.40, and Fox Sporta 1’s game was at 0.30. On HGTV, MY LOTTERY DREAM HOUSE returned at 0.35, HOUSE HUNTERS INTL rose 0.06 to 0.28, and HOUSE HUNTERS held at 0.25. MSNBC’s RACHEL MADDOW SHOW led cable news at 0.32/0.49/2.9M, with Fox News’s HANNITY at 0.22/0.42/3.3M, and CNN’s CUOMO PRIME TIME at 0.20/0.25/1.1M. On HBO, REAL TIME WITH BILL MAHER ticked up to 0.32, and ANIMALS ticked up to 0.06. Univision’s LIGA match was at 0.27. Nickelodeon’s noon PAW PATROL was at 0.26. 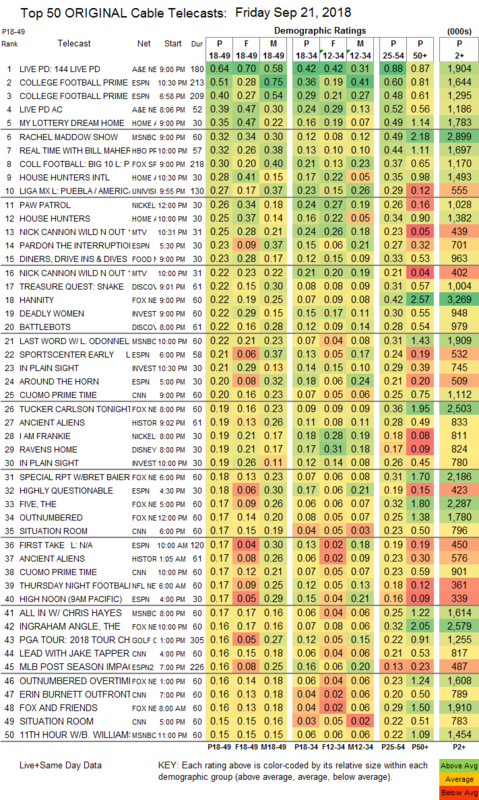 On MTV, WILD N OUT was at 0.25/0.23, compared to last week’s 0.24/0.22. Food Network’s DINERS, DRIVE-INS & DIVES dipped 0.03 to 0.23. On Discovery, TREASURE QUEST gained 0.04 to 0.22, and BATTLEBOTS was up 0.04 to 0.22. On ID, DEADLY WOMEN shed 0.02 to 0.22, and IN PLAIN SIGHT was at 0.21/0.19, compared to last week’s 0.20/0.19. History’s ANCIENT ALIENS returned at 0.19. We’s MARRIAGE BOOT CAMP was steady at 0.15. 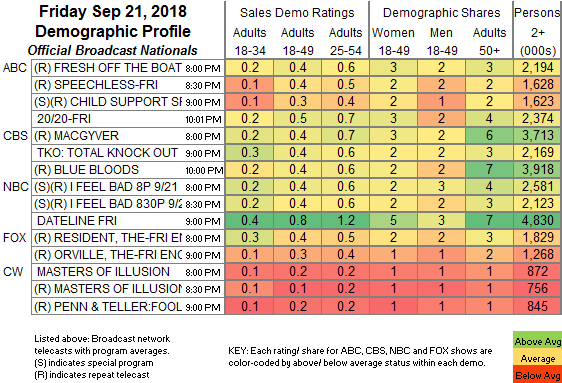 On Syfy, WYNONNA EARP lost 0.02 to 0.11, and the season finale of KILLJOYS was up 0.03 to 0.10. Cinemax’s was steady at 0.03/93K.